Charlie goes to a spa to dry out, but he takes a trunk of liquor with him. He tangles with another's gouty foot in a revolving door. Later he thinks the gouty man is making love signs to him (he doesn't Edna, the real object of the man's efforts), so he signs back. He interprets a message to be a wrestling match. When management throws his liquor into the fountain, when flow the healthful waters, everyone gets drunk. 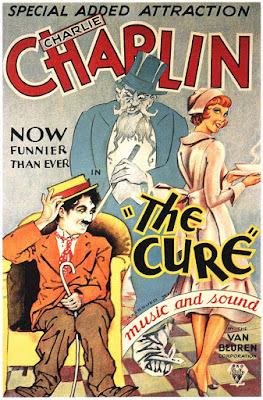 The Cure is a 1917 SHORT comedy film written and directed by Charlie Chaplin.